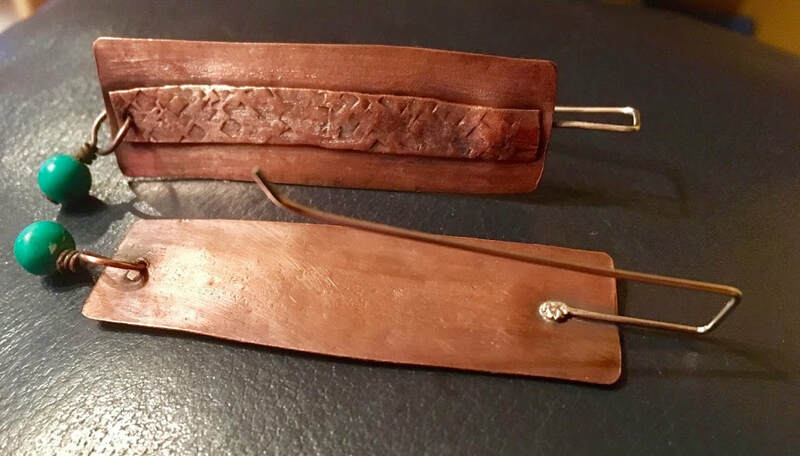 These pieces are from my forays into metalsmithing and fold forming. The pieces are contemporary, colourful and light, and very fun to wear. 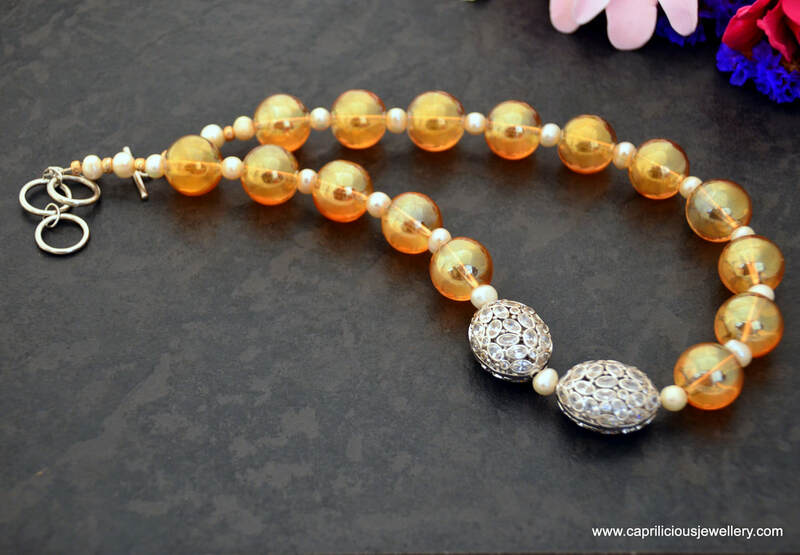 Inexpensive jewellery, for women who like something different. 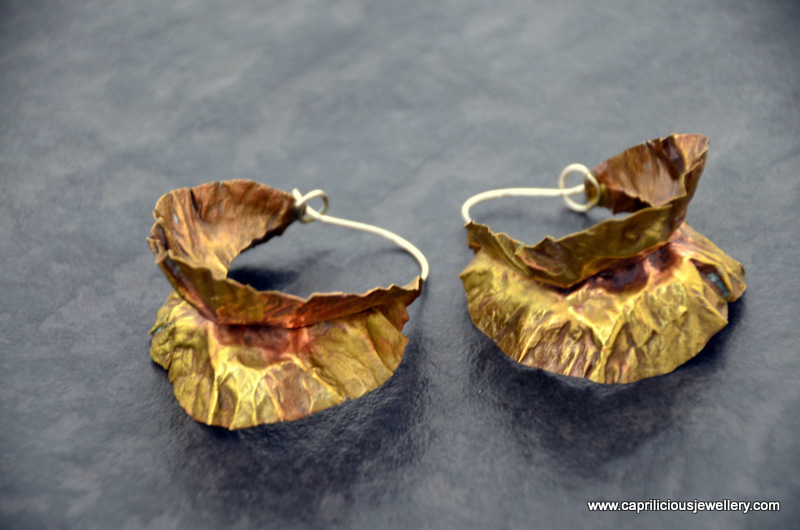 These are bronze hoop earrings, planished, antiqued and burnished from sheet metal. 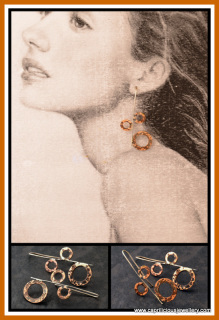 The ear wires are sterling silver and have been soldered on to hang the earrings to best effect. 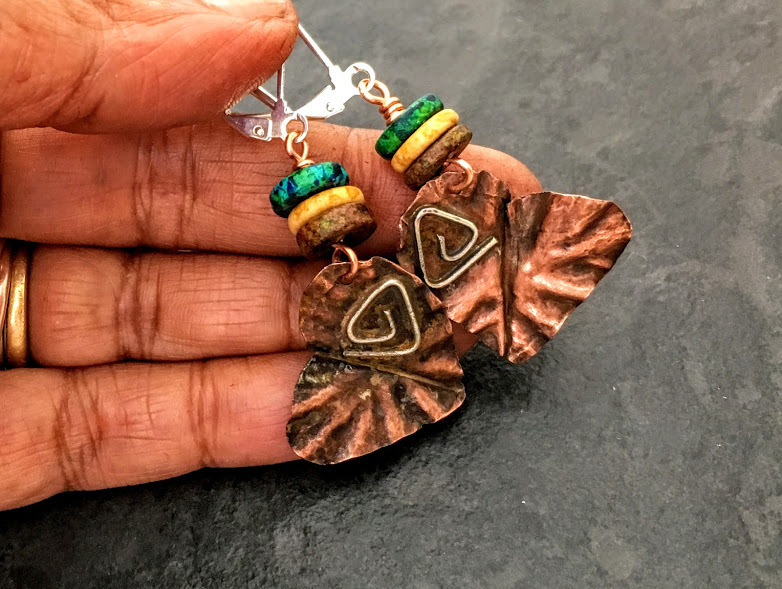 Very light and easy to wear yet impactful and tribal in appearance. 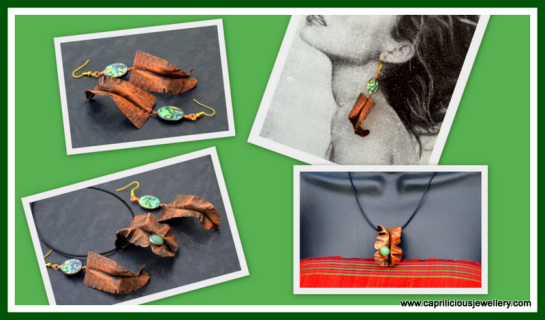 A pair of fold formed copper leaves with abalone beads, 3. 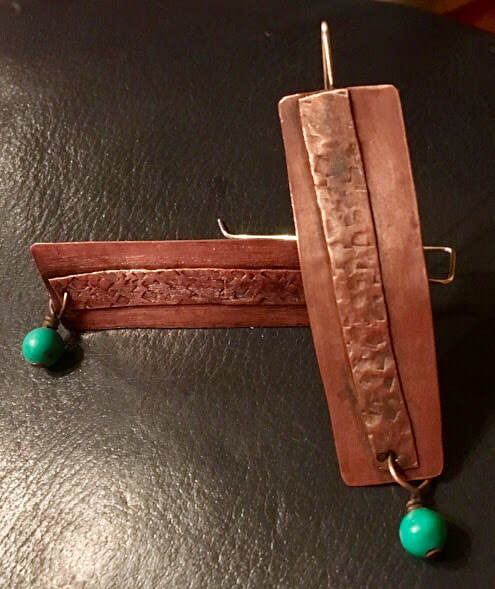 2" long on gold plated ear wires and a leaf pendant on a real leather thong set with a green aventurine in a sterling silver bezel. 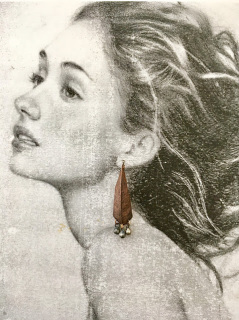 The leaves are graceful and light and you will love wearing them as part of a day to evening ensemble - the earrings are very showy. Slender arcs that have been fold formed from copper sheet metal, hand formed, burnished, antiqued and polished, with sterling silver ear wires. 2.9" long, with little silver bells that tinkle gently when you move your head - very feminine and dainty for a piece that has literally been beaten out of a sheet of metal. Multiple copper circles with texture and patina are soldered to long sterling silver ear wires. 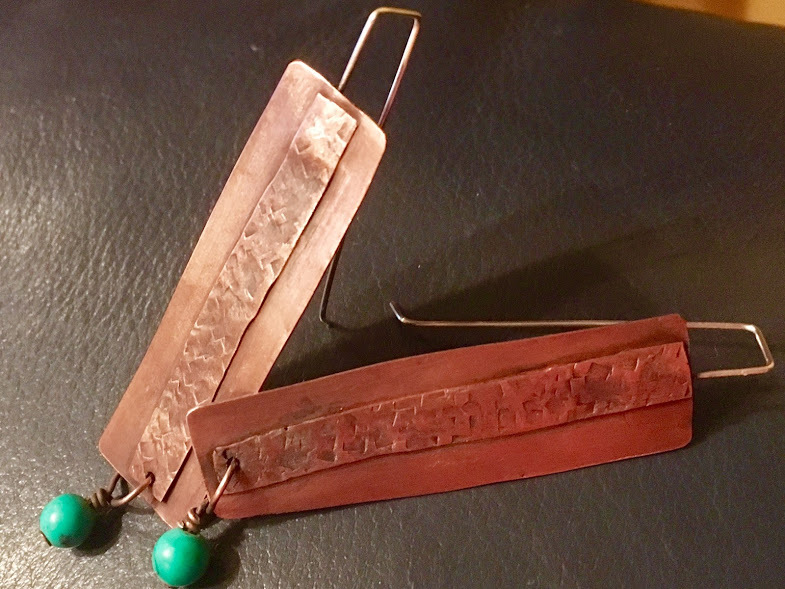 3" long, light and contemporary. 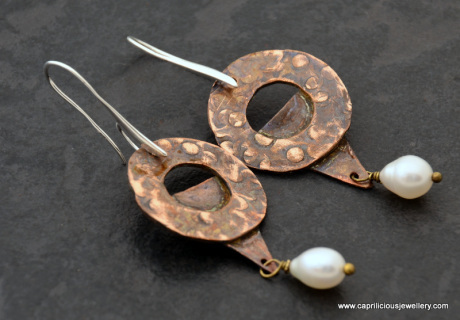 Copper earrings on silver ear wires in the shape of ice cream cones, textured and patinated, dripping a pearl from the tip of the cone. 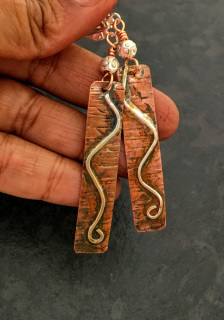 2.2" long and very pretty daytime earrings.